I cannot recommend this book highly enough. Packed from cover to cover with ideas of how to apply careful thought and dramatic conventions into the classroom by creating a world with in a world were children feel genuine responsibility for their learning and for the situation or story in which their curriculum sits. It really should be a must read for every teacher, from ITT to experienced practitioner. Tim Taylor is a teacher. After five years working in schools in Egypt, Czechoslovakia, and Spain, he became a primary school teacher in 1995. He is currently a freelance teacher and teacher-trainer in Mantle of the Expert, and since 2006 has been a visiting lecturer at Newcastle University and for the Qattan Foundation in Palestine. 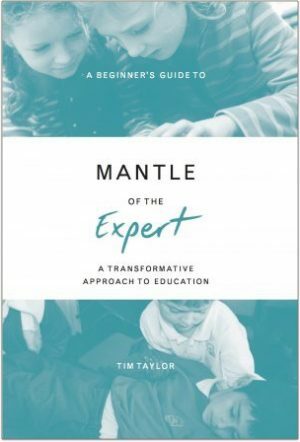 A Beginner’s Guide to Mantle of the Expert is his first book. "This is the book I wish I had had when I was starting out as a teacher. And even now, twenty-one years on, I know it's one I'll return to again and again. Tim doesn't just tell us - in simple, clear and glorious detail - the what and how of Mantle of the Expert. But he delves beautifully and sensitively into the why. He shows us the importance of perspective in building children's capacities for acting with grace, responsibility and thoughtfulness. He examines the careful balance between freedom and rigour that the pedagogy offers. He gives clear and engaging examples from his own practice and ultimately, he reminds us that to be a teacher is to be a guide into a future in which children are equipped with the power to build a better world." I am not affiliated with Tim Taylor or Imaginative Inquiry. These represent my personal opinions only. This website has been written and designed by teachers for schools interested in developing new and effective pedagogical approaches to teaching and learning. Approaches that work best for children, raise standards across the curriculum, and prepare learners for the challenges and changes they will face in the future. PrimEd is a free digital magazine written by educators, for educators. Contributors come from all areas of Primary education, sharing ideas, expertise and advice. Contact them at primedmagazine@gmail.com with comments, suggestions or article ideas. In a place where young minds are moulded it’s important to have an environment that is inspiring and motivating. At The Learning Escape, we design innovative bespoke eco-classrooms and buildings that encourage environmental citizenship, outdoor learning and educational play, and help re-connect students with nature. Outdoor Matters is the quality early years training and consultancy service that promotes the promotion of the outdoor environment for young children's play, learning and development. Collected on this page are a set of full-colour booklets and training resources for creating and developing learning spaces indoors and out for children aged 2 and up. All free and well worth a look. "Active Learning & Educational Resources Ltd (ALERL) is an importer and distributor of high quality educational toys and resources. We source high quality and innovative products from around the world, and all are carefully selected and tested within the market. The products are chosen with a view to helping stimulate learning and senses, and enhance play. Play is important for children as it greatly contributes to the physical, emotional, social, cognitive, linguistic, imaginative and creative domains of development, and is also a key means for children with special needs or learning disabilities to use, to achieve positive developmental outcomes." This website is designed to provide teachers with links to useful websites/resources thus saving time. Brilliant website with daily and weekly programmes of mental maths for Y4-6. Get it while it is FREE! Qualified teachers who are Ofsted outstanding educators, focused on delivering quality training and guidance through CPD and project based work. David Mitchell’s background has centred around use of new technologies to impact standards in the classroom. A team of school improvement specialists, consultants and leaders in the fields of literacy, English as an additional language and ethnic minority achievement. Collaborative learning is at the heart of their approach. Working with local authorities, schools and teachers to help their particular pupils achieve. Their training is always interactive. Practicing what they preach, courses and consultancy are constantly reshaped to meet the particular needs of a school, group of schools or local authority.